A couple of weeks ago I attended an interactive seminar by Herman Miller. The focus was on whether the modern office supports working alone. Has the importance of individual work been lost with the current trend swinging towards collaborative areas within open plan offices? Whilst conversing with other guests at the seminar, we interestingly discovered a lot of the responses related to working from home or in cellular offices: ‘lack of support, procrastination, lack of IT support, and time management’. A few comments were also made from people working in an open plan styled office: ‘too much noise, too little noise, other distractions, and interruptions’. How do we overcome these problems? So much of your ability to do the job well is driven by your state of mind and environment. We need to consider the time of day, tasks and state of mind when people are doing individual work or need to be on their own. Another important factor is how individual personalities affect what is needed from an office space. Herman Miller identifying the most common different states of mind of office employees, the challenge is to then figure out how to make the office environment suit all. The first and most obvious state of mind is when focus and a high level of concentration is needed, this can be called ‘Locked In, Blocked Out’. There are two different ways of looking at this depending on the individual or the task they are completing. While analysing data or writing a report you may want to be ‘On My Own’ completely locked away from people without any noise or disturbance. Alternatively, you may want to be ‘In The Mix’ of the hustle and bustle but without any interruptions or distractions. The type of furniture needed for ‘On My Own’ is a space that encloses the individual and signals, with a barrier, that they do not want to be disturbed. This may be a glass fronted pod without a phone and a single desk, for example Orangebox Air3. Alternately a pod, for example Ocee Design Den Cube, that has a physical barrier with acoustic properties between the office and the individual may be preferred. On the other hand, ‘In The Mix’ is more about the user being among co-workers whilst still signalling that they do not want to be disturbed. The Ocee Design Den ZigZag is a perfect solution for this. Even a booth sofa, such as Brix Up from Verco Office Furniture, can work well if you place the product facing away from the open office environment. 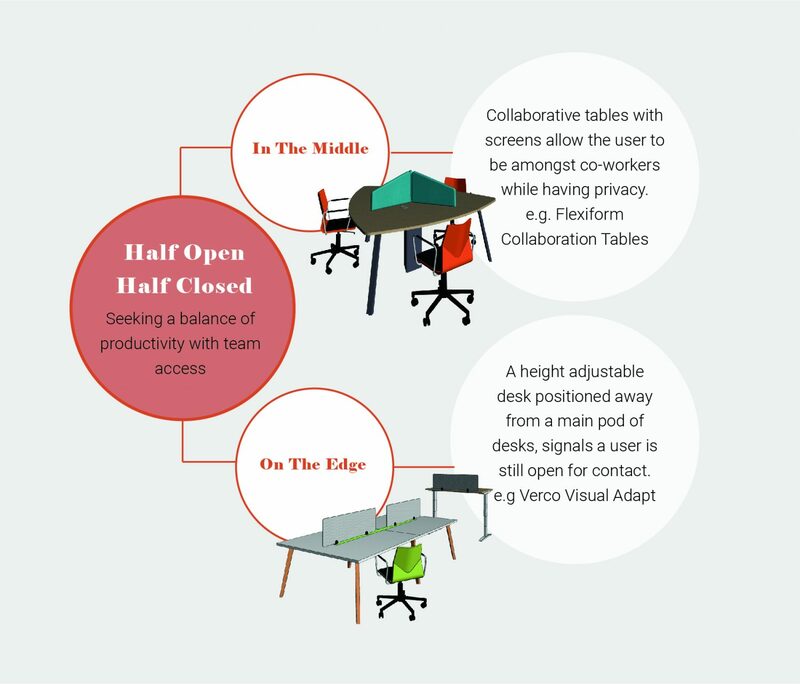 ‘Half Open, Half Closed’ is when you are seeking a balance of productivity and team access. You are in the thinking zone and open to disruptions when required. Of course, depending on the individual and the task, they may want to be ‘In The Middle’ of their team and office environment to be readily available to others. Or, ‘On The Edge’ to feel present within a group but without the need to interact all the time. The space needed for this kind of working differs from completely blocking out the rest of the office. Large collaborative tables with low diving screens are great for ‘In The Middle’ working. A popular product from Flexiform, Collaboration Tables, allow the user to be amongst co-workers and with a small amount of privacy. A great product for ‘On The Edge’ working could be a height adjustable desk positioned away from a main pod of desks. Again, this means you are accessible to your team by a short walk and by not enclosing the area off, signals you are still open for contact. The third is classed as ‘Opportunistic’ when you have between five and thirty minutes between obligations to have a productive burst, for example to catch up with emails or reviewing the slides of a presentation. ‘Opportunistic’ can be split into two opposing sides ‘In A Rush’ and ‘On The Go’. You could be ‘In A Rush’ to email a client who has phoned whilst you were in a meeting before heading off to the next one. Interruptions during this this would be unwanted. Alternatively, when you are ‘On The Go’, you want to use the limited time you have productively but available for interruptions. 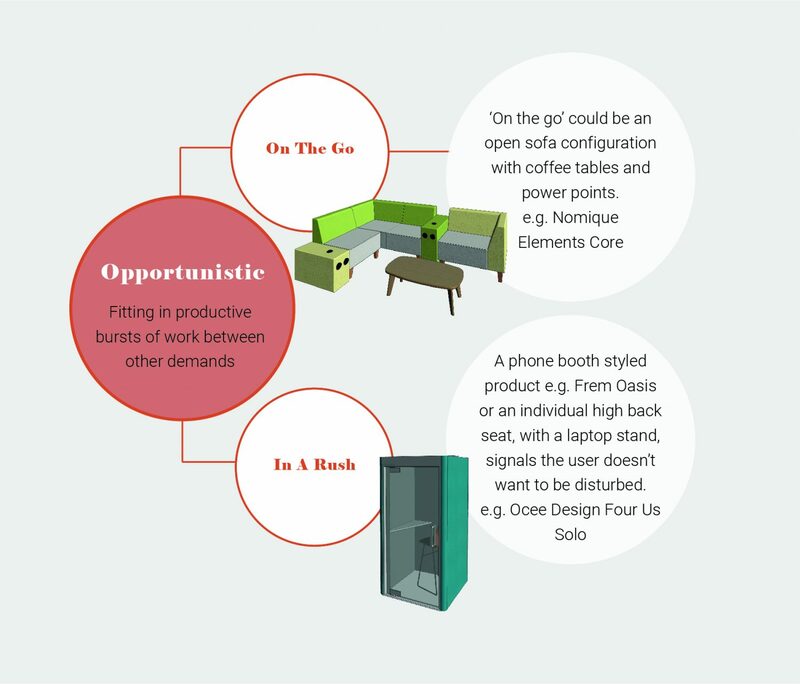 ‘On The Go’ could be an open sofa configuration with coffee tables and power points, for example Nomique Elements Core. Working in an open plan informal area signals you are available for conversation. On the other hand, A phone booth styled product, for example Oasis by Frem, would work well for ‘In A Rush’ working. An individual high back seat with a laptop stand, i.e. the Four Us Solo from Ocee Design, is equally as good and creates a barrier signalling the user doesn’t want to be disturbed. ‘Glide’ is re-energising or relaxing while doing light work. The two branches of this state may depend on whether your personality type is introvert or extrovert. Some people (extrovert) prefer to be ‘In The Buzz’ while doing tasks like reading an article; being in the buzz helps to inspire and energise them. 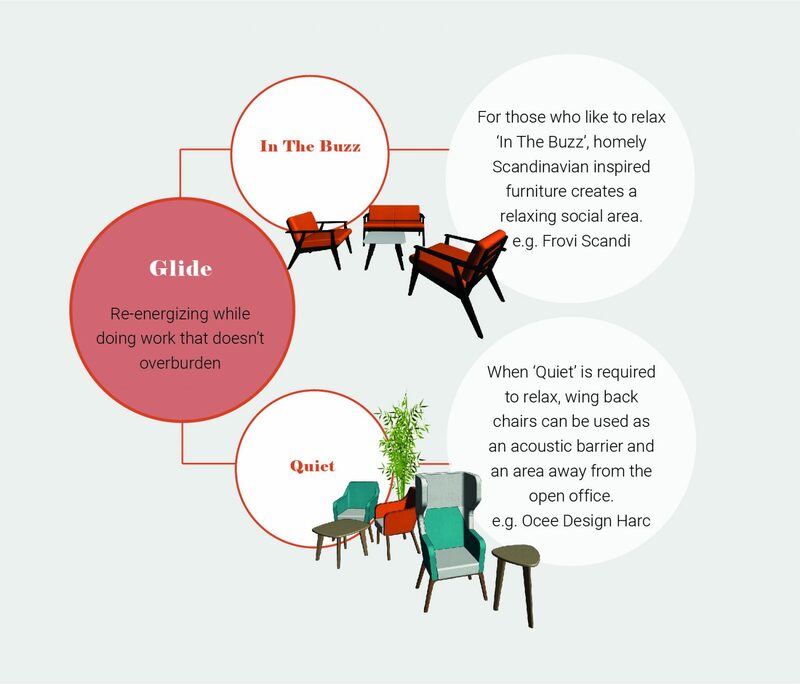 However, other people (introvert) will like to be ‘Quiet’ and need an area to relax while they are carrying out the same kind of tasks. It is important to note that individuals can be both introvert and extrovert, and the way in which these types of people prefer to work at a certain time of day and on a specific task can differ dependant on their current mood. For those who like to relax ‘In The Buzz’, homely Scandinavian inspired furniture creates a relaxing social area, the Scandi range from Frovi is a good example of this. 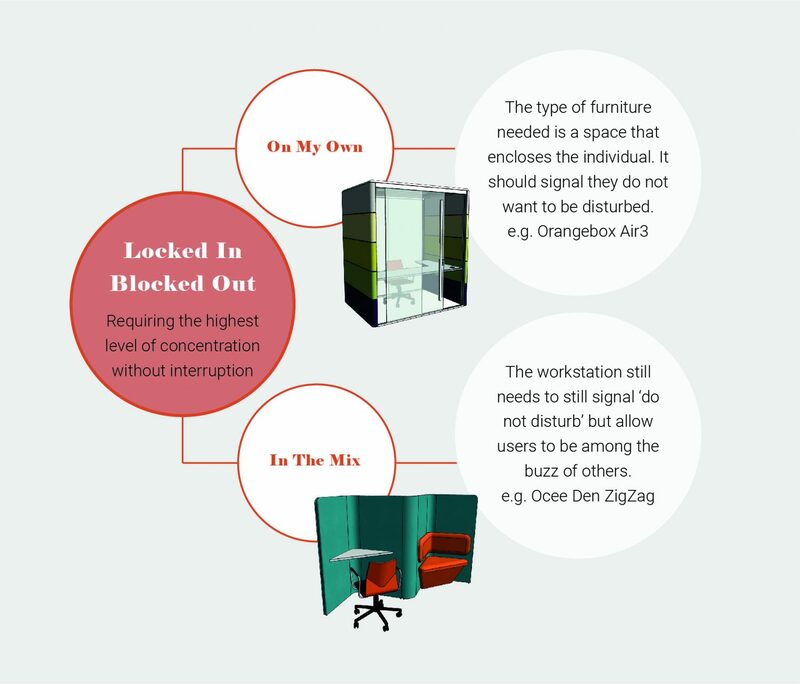 When ‘Quiet’ is required, individual wing back chairs can be used to create an acoustic barrier and a small area away from the open office. The final state is ‘Restore’ taking a break to be more effective while working. Again, your personality, mood, and stress levels will determine whether you want to be surrounded by other members of staff when you are simply getting a coffee or just spending a bit of time away from the desk. Individuals who would like to ‘Recharge’ may prefer the buzz of a canteen area, whereas those who want a ‘Quiet’ space to relax, pray or even have a nap may need isolation so they are not interrupted. High table seating areas create spaces where you can sit and take a break or stand and have a chat as you pass through. 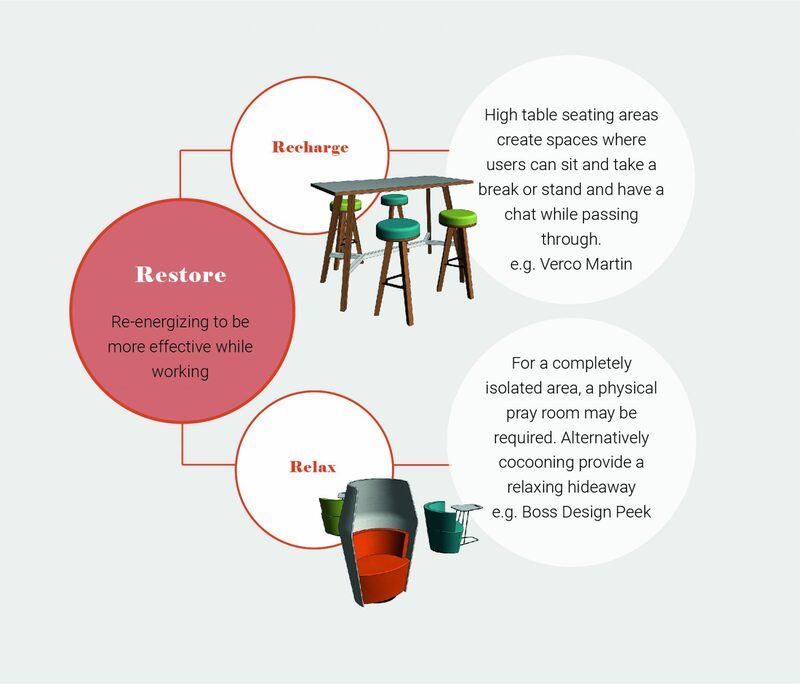 Verco’s Martin High Tables are a perfect product for emplyees to ‘Recharge’ and the use of wood within these kind of products gives a good nod in the direction of biophilia. For a completely ‘Quiet’ isolated area, a physical prayer room may be required. Alternatively, if a quiet relaxing environment is needed, cocooning seats combined with a variety of plants, a view of nature and other elements of biophilia will create a calm and focussed atmosphere for the user. A good example of a cocooning styled chair is the Peek by Boss Design Group. We found it extremely informative to think about these different states of mind and how different they can vary depending on the individual’s personality or a particular task. The most important aspect we discovered is to have a common language. Talking about the states with colleagues and clients becomes so much easier and almost creates a check list to assess whether everyone’s needs are being met within the office environment. A big thank you to Herman Miller for a very informative session!